The Smart Pressure Device SPD series of pressure sensors are silicon based and encapsulated in all kind of housings. The pressure range can vary between about 10 mBar and 20 Bar gauge, absolute and differential. In case of the absolute version, the reference vacuum chamber is formed on the die during manufacturing. The Smartec Pressure Devices are based on the principle that pressure in a liquid or gas will bend a membrane. This membrane has a very thin conductive screened layer that bends with the membrane. The resistance of the conductive layers will changes as the membrane bends. This bending is measured by means of a Wheatstone bridge. In general the screened resistors are also sensitive to temperature which means a compensation for temperature effects is required. The internal amplifier includes temperature compensation to provide a stable analogue output. 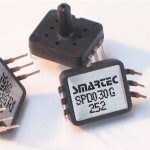 Smartec pressure sensors have a wide range of outputs including bridge, analogue, digital and I2C output. If you require a pressure range or output not provided by the standard parts, please contact your nearest dealer. We may be able to provide custom versions that meet your requirements. Various pressure ranges are available; full scale ranges from 0.350 to 6.5 Bar. Other ranges can be made on request. Excitation Voltage is typical 5 V (0 – 10 V AC/DC). Bridge resistance is typical 3.3 KO. Wetted materials are: glass, ryton, silicon, fluorsilicon and gold.